Hemp, or Industrial Hemp, and marijuana are part of the same cannabis family, the difference between the two is that hemp is 0.3% or less in THC content (THC being what gets you "high"), in that aspect it is not marijuana and hemp has many industrial uses. The Drug Enforcement Agency (DEA) does not have a legal definition of hemp, categorizing it as marijuana, that is why it is illegal today as stated by the DEA website: However, "hemp" is not a term found in federal law. Since the beginning of time hemp had been a legal and viable cash crop. In early U.S. history it was even mandatory to grow hemp. Going as far back to 1619, America’s first hemp law was enacted at Jamestown Colony, Virginia. All farmers were ordered to grow hemp seed. Mandatory cultivation laws were enacted in Massachusetts in 1631, Connecticut in 1632, and in the Chesapeake colonies in the 1700’s. Hemp was even used as legal tender in most of America from 1631 until the early 1800’s. The reason for making it legal tender was to encourage farmers to grow hemp. If you did not grow hemp during periods of shortages, you could be jailed! Back then you could pay your taxes with hemp, for over 200 years. In the early 1930s, innovations in farm machinery would have caused a revolution in the effeciency of processing hemp. A machine which could process hemp on an efficient, industriazied scale, had had new patents applied for. Prior to this, cultivated hemp was laboriously processed by manpower and was very time consuming in its preparation for industrial use. This improved technology could have created many new jobs generating thousands of quality products and by-products from processed hemp on an industrial scale, theoretically aiding the United States out of the Great Depression. Note: Machines to process hemp had been invented starting in the mid to late 1800's in other countries and several in America in the early 1900's, it was called a Decorticator. There has been much Internet debate that no such machines were invented or patents applied for in the era around the 1930's, but this is not true as several patents were filed between 1924-1943. See Fibre Decorticating Machine Patents. It was also during this time that the invention of the recovery boiler by G.H. Tomlinson allowed kraft (German word for strength) paper mills to recycle almost all of their pulping chemicals and allowed a wider variety of woods to be used, in turn producing stronger fibres which became the dominant pulping process for making paper. This was a great interest for newspaper magnet William Randolph Hearst and the Hearst Paper Manufacturing Division of Kimberly Clark, which were heavily invested in vast acreage of timber lands for producing wood pulp for paper. Hearst supplied most paper products and he stood to lose billions if the processing of hemp became industrialized efficiently. In 1937, DuPont patented the synthetic processes to make plastics and many other base products for industrial use, such as varnish, from petroleum. DuPont urged stockholders to invest in its new petrochemical division. Until Dupont’s inventions hemp's oil was used in almost all varnishes and paints. Over all, hemp industrialization would have rivaled many of Dupont’s projected business ideas using their new patented petrochemical processes. With foresight, financier Andrew Mellon, U.S. Secretary of the Treasury (1921-32) and Dupont’s primary investor, appointed his future nephew-in-law, Harry J. Anslinger, as commissioner of the new Federal Bureau of Narcotics in 1930. Anslinger's previous job was the assistant alcohol prohibition commissioner of the Bureau of Prohibition. With the new hemp processing machinery looming to revolutionize the very industries that were sacred to Hearst, DuPont and the financial stability of Mellon, secret meetings were held by these financial tycoons. 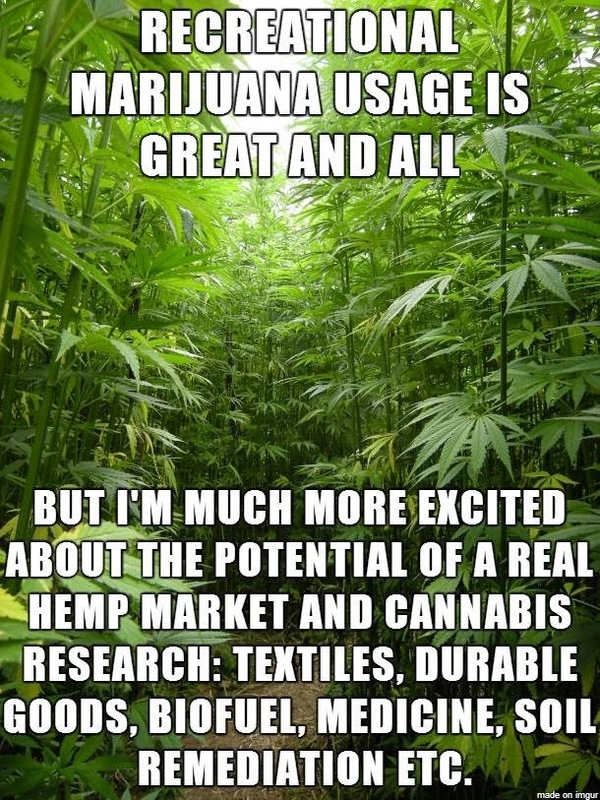 Hemp was declared a threat to their billion dollar enterprises. For their dynasties to remain intact, the competition of industrialized hemp had to be eliminated. Because industrial hemp and the marijuana drug looked the same, the only difference is how it is grown, these men took an obscure Mexican slang word, marihuana, and pushed it into the consciousness of America as “Reefer Madness”. William Randolph Hearst was more than happy to use his newspaper conglomerate to spread the propaganda. And it worked. Basically, hemp was made illegal to grow by the passing of the Marihuana Tax Act of 1937 as the new tax did not define the difference between industrial cannabis (hemp) as being a separate entity from marijuana-the drug, therefore classifying Cannabis Sativa L. as one plant with no distinctions between the two. Now, by proxy, both hemp and marijuana had been deemed dangerous and eventually made illegal through further legislation such as the Controlled Substance Act of 1970 because there still was not a defined definition of the types of cannabis plants. Hemp can become legal by simple definition. In 2009 and again in 2011 the Industrial Hemp Farming Act was submitted by Ron Paul to exclude industrial hemp from the definition of marihuana. --- It's that simple! The term "marihuana" does not include industrial hemp. As used in the preceding sentence, the term "industrial hemp" means the plant Cannabis sativa L. and any part of such plant, whether growing or not, with a delta-9 tetrahydrocannabinol [THC] concentration that does not exceed 0.3 percent on a dry weight basis. "...haven't you heard it's a battle of words, the poster bearer cried..."
Pink Floyd lyrics from, Dark Side of the Moon.